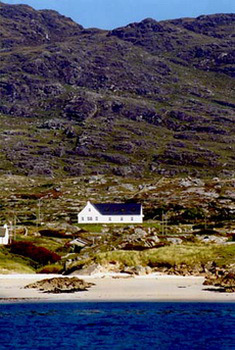 Fáilte – Welcome to Errisbeg Lodge B&B, 2.5km from Roundstone village, in the Heart of Connemara, Co. Galway, on the West Coast of Ireland – where many of the Old Ways, Values and Traditions still survive. Errisbeg Lodge, our informal Irish Home, is spectacularly set amid Private, spacious Wildflower Gardens, on the slopes of Errisbeg Mountain and overlooks numerous off-shore Islands, and the magnificent Atlantic Beaches of Gurteen & Dog’s Bay. 2 minute Drive from the pretty coastal Village of Roundstone, Errisbeg Lodge – named after Errisbeg Mountain, in our back garden is the perfect location where you can Paint, Photograph, Write, Walk, Hike, Bike, Revitalise & really Get-Away-from-it-All. Enjoy Early Morning Beach Walks before Breakfast and watch the sunrise; or Evening Mountain Walks on Errisbeg and watch the Sunset. Daylight stretches ’til 11 pm or later in Spring & Early Summer! At Errisbeg Lodge you’ll enjoy – cheerful, comfortable Accommodation; Spacious Private Gardens; Mountain, Ocean & Island Views; Free Parking On-Site; Bright, Airy Rooms with excellent Beds, some King-Size, & Showers; Wholesome Breakfasts (incl. Vegetarian + Gluten Free); Books for those with a zest for the written word; Informal Ambience; but above all, Traditional Irish Hospitality and Memories that will last a Lifetime. Your Stay at Errisbeg Lodge – from several Nights to two weeks; Couple or Informal Group; can be as Easy or Energetic as you wish. Our Lodgings is the ideal Central Base from which to Experience and Explore Traditional Connemara, its Unspoilt Land & Seascapes. Most Places of Interest are on your Doorstep, or less than one hour Drive.